Finding your place, perfecting your work, and turning your job into your dream career. Lauren Berger is the founder and CEO of InternQueen.com as well as an author, speaker, and internship expert. 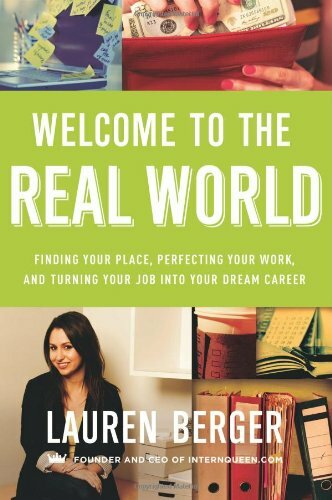 Her latest book, Welcome to the Real World, is basically a Lauren Berger brain dump of what she’s learned in her years as the Intern Queen. The book consists of ten chapters that are full of pertinent information yet very easy to read and to comprehend. I enjoyed reading Welcome to the Real World (Real World) and found that it would be helpful to anyone anywhere along the career path continuum, not just those new to the workforce. Lauren gives you pointers on workplace behavior, appropriate dress, connecting with others, how to manifest your own personal ‘brand,’ how to organize yourself, and how to juggle all those things that you have to do. Her advice is practical and very much worth more than the few dollars of the book’s cost. Particularly valuable is the chapter titled, “Your Money, Your Finances, Your Life.” In my humble opinion, this should be the first chapter instead of ninth. I have several reasons for stating that Chapter 9 should have come first: It’s by far the most important chapter for a young person (or a person of any age for that matter), it teaches real life lessons, it’s worth the price of the entire book on its own, and directness of the material. To explain my “directness” reason, Lauren is direct and to the point in this chapter. There are no gray lines when it comes to finances. You must have discipline and you must have a plan. You have to handle money intelligently, no matter how much or how little you make. She gets to the point in each section without mincing words or adding any extra fluff. She tells it like it is. Read and heed her advice. This chapter should be up front because young people have short attention spans. The phone buzzes with a new text message, a YouTube video distracts you, an email notification pops up, or you notice something happening on television, and you’ve lost your train of thought. If it were the first chapter, it would be read for sure. So many young people get into financial problems and it takes years to recover from them. If you read and adhere to the advice given, you’ll be fine. My favorite chapter, perhaps because of where I am in my career, is Chapter 4, How to Work Your Personal Brand. To me, creating, developing, and working your personal brand is the most important way that you can move up in your company or get a different job outside of your company. You should always be aware of how you portray your personal brand and how others perceive you. Wise advice from Lauren. Mark this chapter and reread it often. Some of the people she mentions pay thousands of dollars to ‘coaches’ to help them develop their brands. You don’t necessarily need to do that. Just read the chapter. Finally, Lauren wraps it up with Chapter 10: Time to Get Personal, which is more or less a ‘care and feeding’ of you discussion. In all, the book is very good. Lauren has a lot of good advice to give you and she teaches you how to put her advice into practice. I love the practicality of the book. Oftentimes, books written by what I’ll loosely call “motivational” types, don’t really do anything except boost the personal brands of the writer or alleged writer (most are ghost written, in case you didn’t know that). If you hadn’t guessed already, I highly recommend Lauren’s book and her website, no matter where you are in your career. There’s something valuable for everyone. The book is a quick read. 240 pages is pretty short and you can manage it in a few evenings. Put down your cell phones and TV remotes and spend a few hours investing in your career.